The recent VPR poll was conducted like any other general population public opinion poll. The largest sampling frame for telephone was utilized—in this case, a dual-frame sample of landline and cell phone numbers—and the data were weighted to reflect U.S. Census estimates for Vermont’s adult population on age and gender. In addition, the data were also weighted to reflect the county-level populations proportionately. All of the data related to issues, job performance ratings, and the 2016 Vermont gubernatorial were weighted to reflect the views of the general population. During data collection, the Polling Institute works the sample to achieve the highest response rates possible given time and budget constraints, and in the end, the general population weights are relatively small and do not distort the original data a great deal. 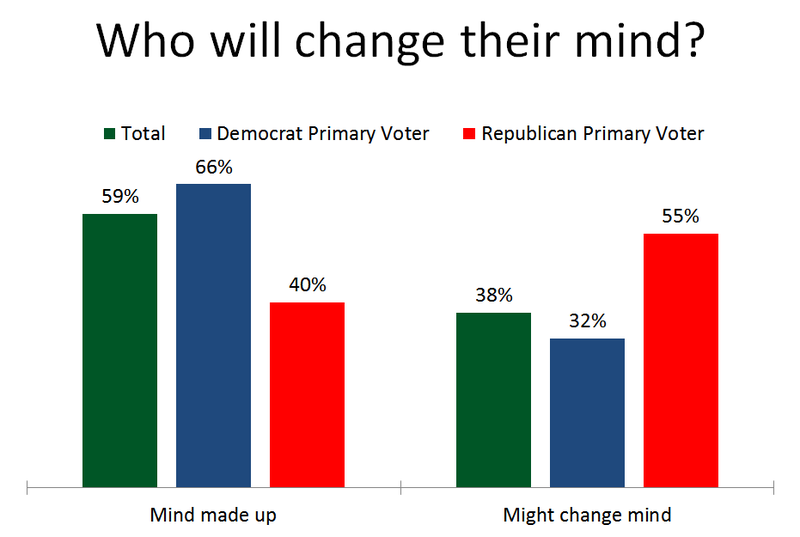 The data reflecting preferences in the upcoming Vermont presidential primary are weighted to reflect the population of likely voters in each of the party’s primary. Weighting the general population is far easier than weighting to likely voters because we have hard data from the Census Bureau describing the general population. The general population actually exists at the time of the poll; this is not the case when considering likely voters. The voting population does not yet exist; there are no pre-existing measure of who what citizens (or poll respondents) will actually cast a ballot on March 1 (or before by absentee ballot). 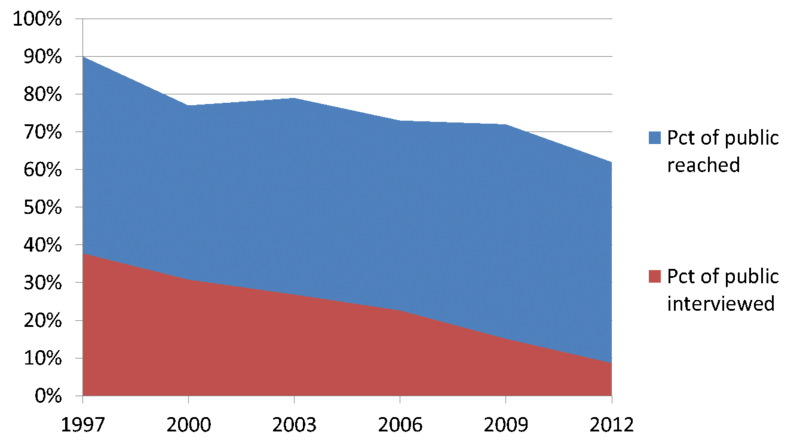 Weighting to the voting population is weighting to a population that is still speculative. That is why we refer to likely voters as opposed to actual voters. But if we want to estimate what voters may do on election day, we have to recognize that the entire adult population does not vote, and in a primary, the proportion of voters will be lower than that found in a general election. 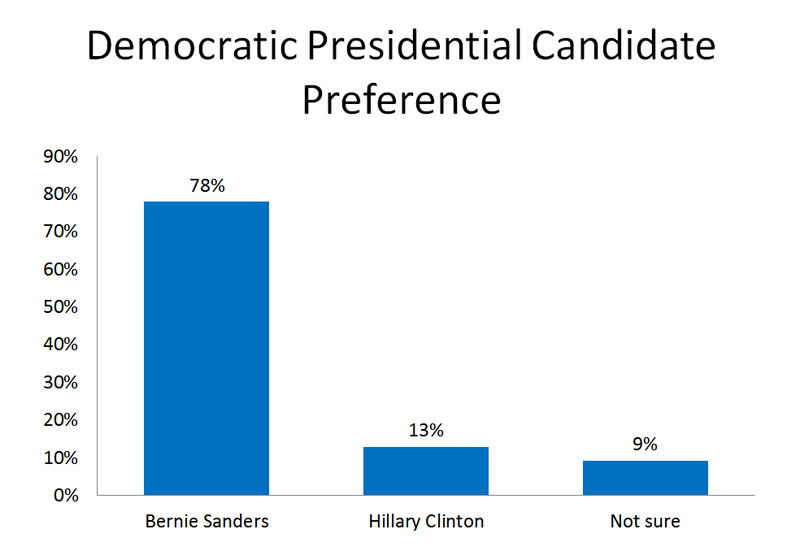 Say that they are either “not too likely” or “not at all likely” to vote in the Vermont Presidential Primary. Using that criteria, we eliminated 258 actual respondents (unweighted), bringing us to an unweighted base of 637 records or 71 percent of the original data set. 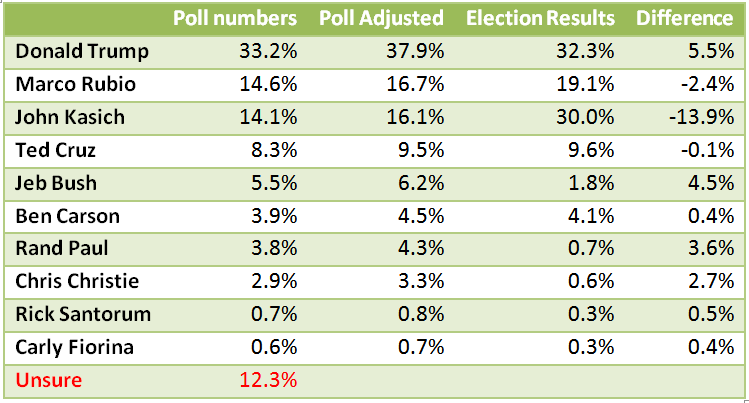 We then worked with those remaining records to devise a variable that would give greater weight to those respondents among those remaining who are most likely to vote in the presidential primaries, since we know that turnout will not be as high as 71 percent. In fact, we estimate that turnout will be from 40 – 45 percent of registered voters. These criteria were used to generate weights for each individual case that were then applied to the general population weights to devise a new weight variable defining our “likely voter model.” The first two criteria take what respondents tell us about their interest in the election and how likely they are to participate, while criteria 3 and 4 apply data from the demographics that are associated with voting participation. The last criterion takes into account that candidate preference shifted measurably after the New Hampshire primary showed that Trump and Sanders can win and that Kasich may be more of a contender than earlier thought. Applying the likely voter model to the reduced data set left us with a dataset that represents 58 percent of the originally weighted sample—a figure higher than our voter turnout estimation but weighted to give those within the remaining sample who meet likely voter criteria a greater weighted response. Philip Bump of The Washington Post wrote a column titled, “Why were the Iowa polls so wrong?” (February 2, 2016, The Fix) and on the same day, Mark Blumenthal and Jon Cohen had a Huffington Post blog titled, “Were The Iowa Polls Wrong? Maybe They Were Just Too Early.” (February 2, 2016). So were the Iowa polls “wrong,” and if so, what was wrong with them? To answer this question, we have to ask, “what are they meant to reflect?” Naturally, it goes without saying that the media expect polls to predict elections; the horse-race questions tell us who is in the lead, and the final horse-race poll should show who is first past the finish line. But to beat the horse race metaphor into the ground, if the horses are very close in the final poll, though not yet across the line, it is not inconceivable that the leader should slip and ultimately lose. 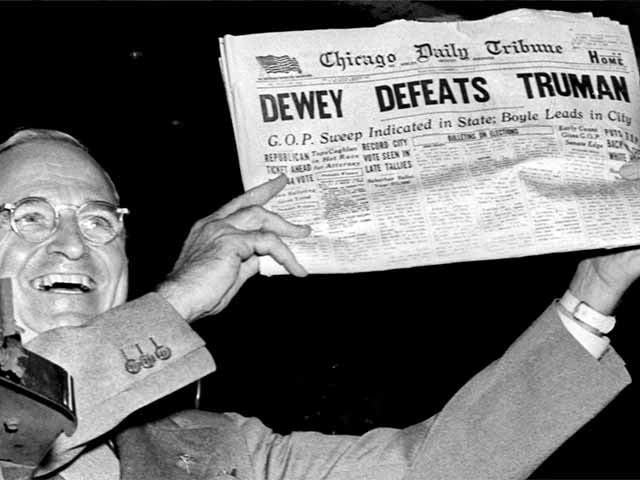 “Dewey defeats Truman” is a classic example of a polling debacle, but it would not be fair to say that the polls in 1948 were wrong; they just stopped polling too early and didn’t take measure of the last part of the race when Truman passed Dewey on the final turn. Polls are a snap shot of opinion, and opinion can change, as it did in the 1948 presidential race, and again in the 2008 Democratic primary, when polls showed a lead for then-Senator Obama before Hillary Clinton pulled out a victory. So it is possible that the Selzer Des Moines Register poll was not incorrect; it was just too early, as Mark Blumenthal and Jon Cohen conclude in their analysis. In addition, Patrick Murray, the director of the Monmouth Poll, did the thankless post-mortem work on his polls to investigate what went wrong. Monmouth called over 250 of the Iowan Republicans interviewed in their poll and found that a higher than average number of Trump supporters never went to the caucuses, but more importantly, many Republicans changed their minds and decided late to caucus for Ted Cruz. This story was reported by the Huffington Post on February 5th. So, when the most recent CNN/WMUR poll in New Hampshire came out on February 4, 2016 with the headline, “NH Poll: Trump on top, Rubio in second,” I immediately searched for the level of undecideds. 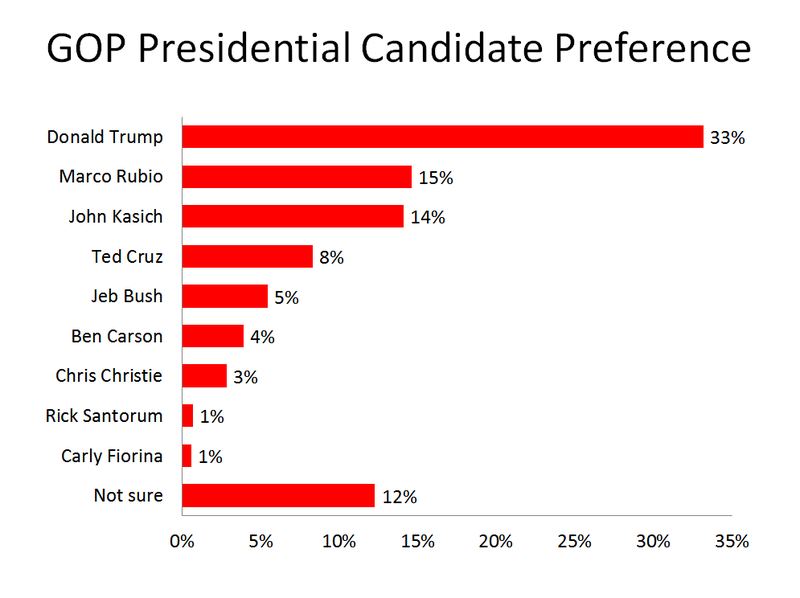 With only five days to go before the primary, one third of GOP primary voters said that they were undecided. If decisions are made in the polling booth or just a day or hours before voting, polls will reflect the final vote only if the undecided voters break out the way the decided voters are distributed. If last minute deciders break toward one candidate in larger proportions, the poll may have been “right” in that it reflects the public at that time, but it would not reflect the election outcome.